Hmmm…stitching, water coloring, heat embossing…that pretty much sums up this card. It could easily be used for a wedding, an anniversary or ??? After playing around with some papers for the brushed water color at the top, I settled on Ranger Inkssentials Specialty Stamping Paper and here’s why. There was no pilling or funny stuff that happened and my paper stayed perfectly flat. Love it! 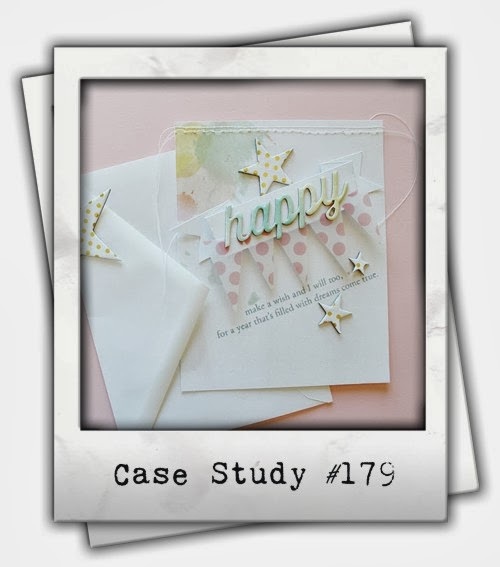 I started out by die cutting the paper with the diagonal die. Next I heat embossed the beautiful little dandelions (can you tell I’m in LOVE with these?). Then, I rubbed my inks onto a stamping block, spritzed them with a bit of water and then picked up the color with a paint brush. Just painted across the embossed areas in a haphazard sort of fashion. The sentiment was simply stamped in black and I added a smattering of sequins. The top and bottom panels were popped up on dimensionals and done! Gorgeous ethereal creation! Great use of these papers and images! Thanks for playing with my starry challenge this week! You are on a roll, woman! Fabulous card! Oh my, this is breathtaking! Gorgeous movement, color and texture! Thank you for playing with us…twice! Seeing your card made me think of Danielle's card…. even before I realized you'd make it for the Case Study Challenge. Fabulous job! It's gorgeous! 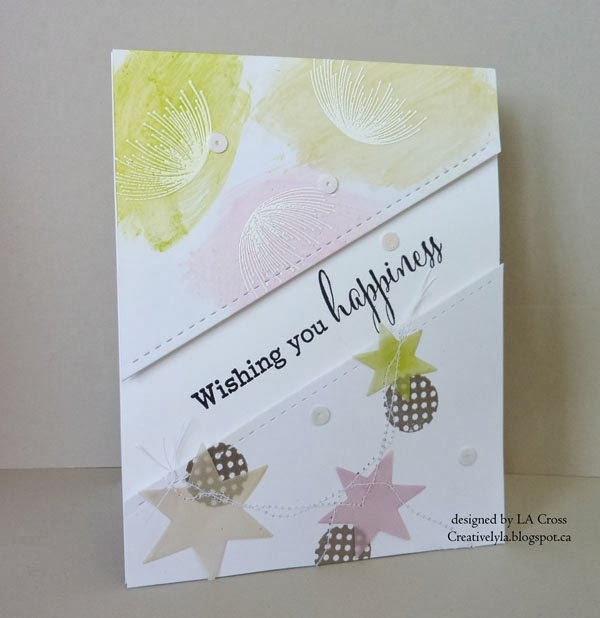 Awesome CASE card — aren't the softer colors just stunning! A beautiful cards with a great layout! I love the subtle colors and the stitching. Thanks for playing with The Paper Players! This is very pretty! I love the soft, but still so happy color tones! Thanks so much for playing along with us over at the Simon Says Stamp Wednesday Challenge! Beautiful card. Congratulations on your shout out over at The Paper Players! 🙂 I am your newest follower!